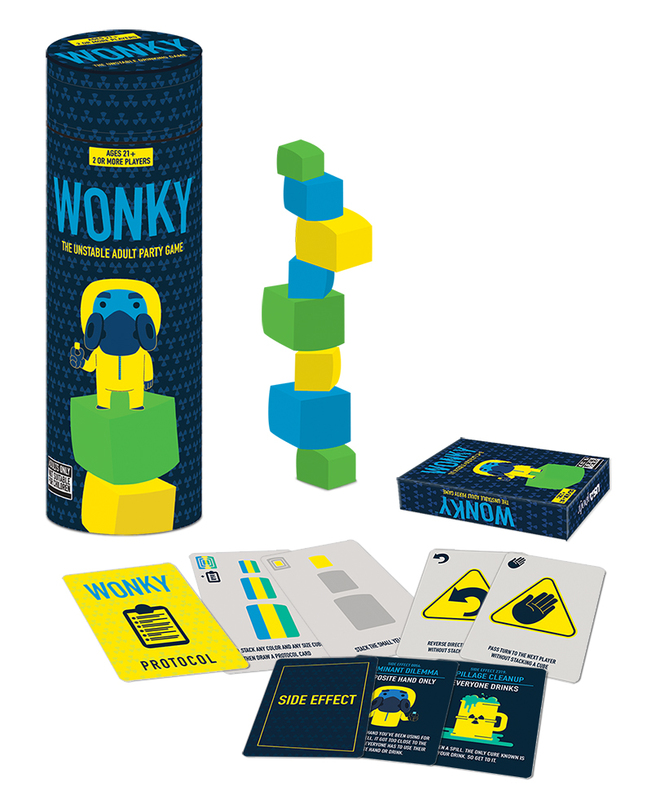 Wonky: The Unstable Adult Party Game is a game published by USAopoly. It is for 2 or more players. In this party style game, players take on the role of a hazmat team that’s tasked on restabilizing some radioactive elements that have been disturbed. They’ll need a steady hand since when the tower of elements topples over, they’ll suffer the consequences. The player that is best able to stack the elements or that can complete all their protocols first will be declared the winner. Before I begin with this review, let me state that this game is intended to be played with adults. The reason being is that it’s basically a drinking game. However I don’t drink so those penalties and situations will not actually be discussed or covered in this review. Instead I’ll simply refer to the drinking penalties as penalties. Just know that for the purpose of my review, these penalties were not enforced. Instead, the player was forced to skip their turn. To begin, all of the element cubes should be placed within reach of all players. The Protocol deck should be shuffled together. Each player is then dealt 7 cards each. The remaining deck is placed face down on the table. The Side Effect deck is then shuffled and placed face down on the table near the Protocol deck. Play now begins. The game is played in a series of turns. Each player’s turn consists of 2 steps; play a protocol card and add a cube to the tower. The first step is to play a protocol card. To do this the player simply chooses one of the card’s in their hand and places it face up in the discard pile. The player then follows the instructions on the card. There are 3 types of cards that a player can play; cube stacking cards, action cards and combo cards. Cube stacking cards, when played, make the player add a cube that matches the one on the card to the top of the tower. If there are no towers already started, then the cube is is placed in the center of the play area, beginning a new tower. Action cards, when played, allow the player to take a special action like skipping another player’s turn or reversing the direction of play. Combo cards, when played, make the player add a cube of any type to the top of the tower. If they succeed and the tower doesn’t fall, then they are able to perform the special action listed on the card. This action could be to make the next player draw a protocol card from the deck and add it to their hand or to reverse the direction of play. The next step of a player’s turn is to add to the tower. If a player played a cube stacking or combo card in the previous step, then they will have to add a cube to the tower that matches the card that they played. The players then count to 3. If the tower remains standing, they are successful and play passes to the next player. If the player successfully adds a cube that’s larger than the cube below it, they are able to pick another player to have a penalty enforced on them. It should be noted that if any cubes in the tower should fall at any time during the player’s turn, they will have a penalty enforced on them. They will also be forced to draw 3 more cards from the Protocol deck and they must also draw a side effect card to be put into play. The player must then play a new protocol card to begin a new tower before ending their turn. It should also be noted that side effect cards once drawn go into effect immediately. The rules must be followed by all players. If a player is caught breaking the rule, they will be forced to take a penalty. There may only be 3 side effects active at any time. If a fourth side effect is drawn, the card that has been active the longest is placed in the discard pile and the new card put into play. The game continues until one of two events happen. If a player has no cards in their hand at the end of their turn, they win. However the player is not allowed to play an action card as their last card. They must successfully add a cube to the tower to win. The other way the game can end is if a player adds the ninth cube to the tower. If this happens the player wins, regardless of how many cards they have in their hand. There aren’t a whole lot of pieces to this game. First off there are 9 element cubes that are brightly colored and made of wood. The quality of these is really good as they’re actually quite sturdy. There is a small, medium and large block in 3 different colors; blue, yellow and green. They’re actually pretty cool. The other thing included with the game is a deck of cards. There is a stack of protocol cards and a smaller one of side effect cards. 69 cards in total. The cards are actually really good quality as well. The artwork and design is really fun and easy to read. I really like the look and feel of them. If I had something to complain about with the components, I think it would be the box/container that everything comes packaged in. It’s a long tube, not a square or rectangular box like most games come in. That makes it extremely difficult to stack on your game shelf with your other games. I really don’t like the tube design and wish that it’d been thought out a bit better. Of course this one probably would just be placed with your party games or other such items instead of putting it with your more serious game collection anyway. Of course I’ll discuss those aspects a bit later. In any event, the game looks nice, apart from the tube. The rulebook for this game is actually quite small and compact. The rules are well written and everything is laid out quite nicely. There are lots of pictures included in the book. The book even contains a run down of all the side effects and how each one works. I didn’t see anything that was difficult to understand at all. Everything is pretty simple and straight forward. Overall the rules look good, nothing to complain about. This game actually falls into 2 categories for me; interesting and useless. The concept behind the game is actually quite interesting. I do like the idea of stacking the different cubes up in a Jenga type fashion and trying not to knock everything off. I like the card playing aspect as well. It has a UNO type feel to it with the pass and reverse action cards, while the side effect cards give it a really unique feel. Of course the side effect cards are where the useless category comes into play for me. I realize that this game is intended for adults. The tube even has a label on it that says as much. The thing is that I’m not a drinker so the “must take a drink” penalties that are incurred while playing the game are pretty much useless to me. That’s why I tried to implement the “skip your turn” house rule instead. Of course, it made the game quite annoying. Nobody wanted to play it again. It doesn’t help that I’m not really big on party games either. That said, I’m sure with the right group of drinking age adults, the game might actually be fun. It does look like it should be fun. We just couldn’t figure out a way to make it work for us. Adult players that like UNO and Jenga might like this one. Family and younger gamers will most likely not. I can’t really recommend this one. As it is, this is a huge pass for me. Wonky: The Unstable Adult Party Game is a party game for adult players that involves drinking as a consequence. The game is relatively short, as most party games are. Most game sessions should last around 10 minutes. The cards are designed well and the blocks are bright and colorful. The game looks really nice. Unfortunately the game is intended for mature gamers that are of drinking age. As I do a lot of family and children’s style games, this one just didn’t work for me. It looks like it would be really fun if there was a way around the drinking aspect of the game. However I was unable to actually find a way to play it that wasn’t completely annoying. If you’re of drinking age and don’t mind the drinking aspect of this game, then this might be a game that you actually enjoy. It does have some Jenga and UNO style mechanics that are ok for party gamers. For me however, I’m not all that keen on either of those games. For me the game is a huge pass and not one that I can recommend. This entry was posted in Reviews and tagged adult, board, board games, card, card games, games, party, unstable, usaopoly, wonky. Bookmark the permalink.